Arch of Titus, Rome, Italy c 81 CE. Golden Age of Pericles- 500 B.C.E. High Hellenistic Period- 350 B.C.- 100 B.C.E. Beginning of Pagan Roman Empire- 200 B.C.E. Roman Empire- 200 B.C.- 315 C.E. Early Christian Era- 315 A.D. - 800 C.E. Form: Using the technology of Roman arches and the advancements of Roman slow drying concrete the massive monument serves no real purpose. The outer surface is adorned with a veneer of marble panels and a facade of functionless post and lintel engaged columns in the Corinthian style. Above the barrel vaulted arch, on both sides of the monument, are inscriptions in Roman capital letters. Inside the two sides of the arche's tunnel are two relief sculptures.Iconography: The use of arches for a monument is an expression of Roman technology and therefore Roman genius. 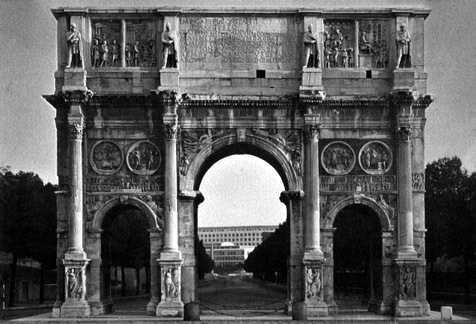 The triumphal arch is a common symbol that is dedicated to the victories of particular emperors. In this case the victory of Titus over the Jews. Context: Titus is the same emperor who completed the construction of the Colosseum. Arches like this were all over Rome and served as honorific gateways over main roads in the city. 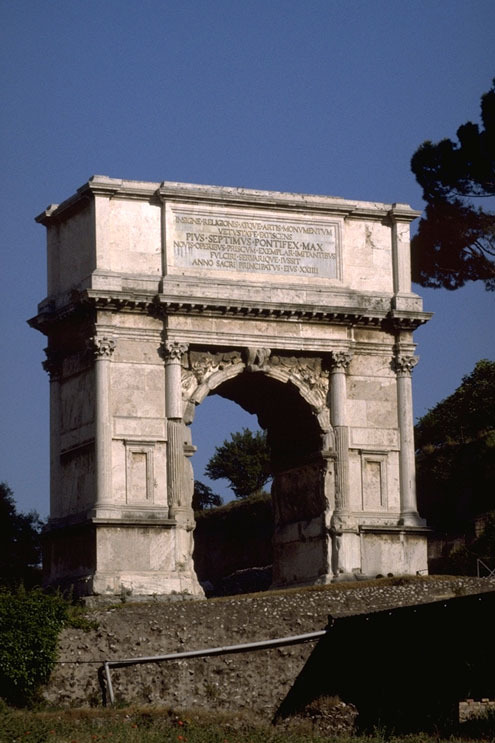 This particular arch was dedicated by Domitian to commemerate his predessesor's victories. Originally there would have been a massive sculpture of four horse chariot and driver. Stokstad (254) gives and excellent contemporary account of the reasons why and circumstances surrounding the creation of this arch. Arch of Titus, Rome c 81 CE. 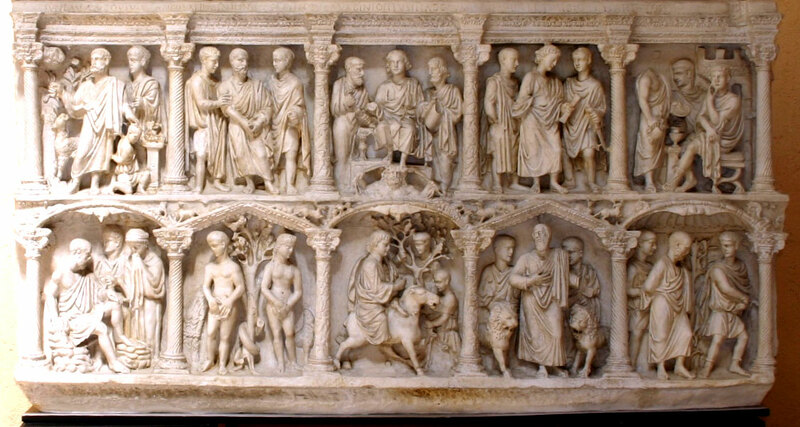 of what this frieze looked like Form: This relief sculpture is very naturalistic and uses relief in order to create a sense of space and volume. Notice the inclusion of the arch in the releif at the far right is depicted at an angle almost as if the sculptors were using linear perspective. Space is also created through size scale relationships, by overlapping the figures and by making the figures and objects in the background lower relief than those in the foreground. The figures are naturalistically depicted and in some instances the drapery almost looks like the wet drapery style that dominates Greek art.Iconography: This is clearly a victory scene as is evidenced by the processional carrying the spoils as they enter a triumphal arch at the left. The icon of Jewish victory and resistance, the menorah, meaning is changed by a its change of context. The Roman soldiers who carry another peoples' cultural icon are demonstrating their own victory by stealing it and exhibiting as a trophy. 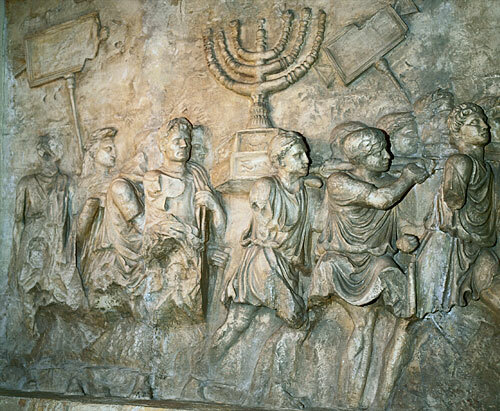 Context: Roman soldiers carrying off the Menorah, the even-branched candelabra, and other spoils from the Temple in Jerusalem. The Roman general Titus had the Temple destroyed (7O CE) and the Jewish population expelled. Jews began to settle throughout the Roman Empire, along the coast of North Africa, in Italy and Spain, along the river Rhine and in France. 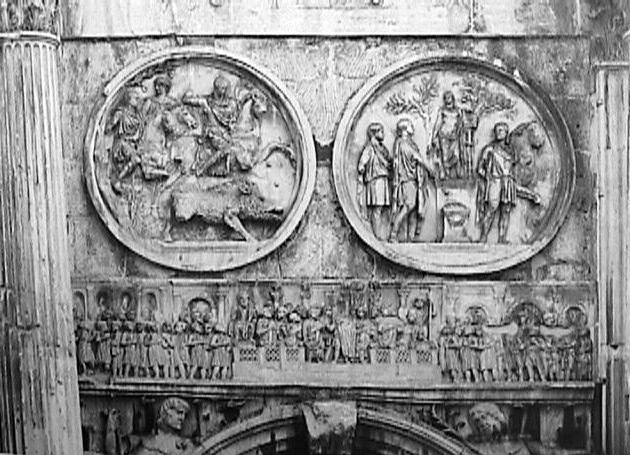 Significantly it was decided to include on the Arch of Constantine reliefs that were taken from monuments made for earlier Emperors. There is a relief in the passageway under the primary arch that is from the time of the Emperor Trajan, while the roundels or medallions were made for the Emperor Hadrian. 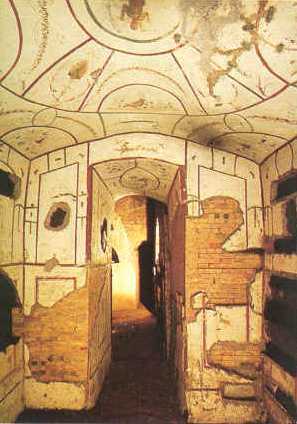 The oblong reliefs in the attic come from the time of the Emperor Marcus Aurelius. Scholars used to argue that this use of "spolia" from earlier buildings was a good indication of artistic decline. More recently scholars have seen this inclusion of earlier monuments as a way of linking Constantine to the great emperors of the past. Context: The arch was was erected in honor of the first Christian Emperor's victory over Maxentius at Soxa Rubra (the Milvian Bridge) in 312 AD, just north of Rome. Constantine then established the city of Constantinople that is now the city of Istanbul in Turkey. Constantine was first Christian emperor although he did not get baptized until he was on his deathbed and he is also the emperor who legalized Christianity with his Edict of Milan c 318 CE. Late Roman Empire Form: The relief sculptures on the exterior of the arch are rather dispaparite in style. 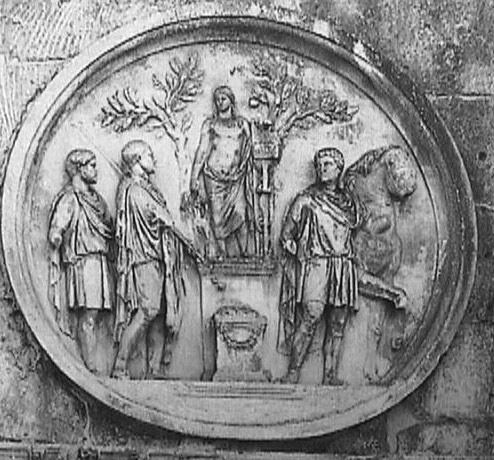 The circular medallions contain very naturalistic sculptures, some standing in contrapposto and wearing the wet drapery style. The frieze beneath these medalions are of a completely different style. The bodies are disproportionate. The heads are too large and the drapery of their clothing does little to reveal the anatomy it covers. The doll like figures lack contrapposto. Unlike the relief from the arch of Titus, this relief does not make any real attempt to create space except fro the architectural elements which are rendered very unimaginatively. Iconography: Gardner suggests that the theft and recarving of the faces of the roundels was an attempt to associate Constantine with the "good" emperors of earlier periods. For some art historians the lower frieze, which represents Constantine addressing the senate represents the decline of the Roman empire at least artistically. The lack of realism could represent the new political and theological climate of Rome. The image is much more diagramatic and straightforward. The viewer has all the iconography placed before them in one single unobstructed view. Constantine is placed in the center of the symmetrically designed composition which puts him in the most important position. Perhaps this new digramatic style is related to the second commandment and its law against images. It has also been suggested that the larger heads and reduction of naturalistic elements relates to the new Christian ideal of deemphasizing the physical world and reemphasizing the spiritual and mental. Context: These medallions are probably sculptures that were transplanted from a monument created in the first century AD. 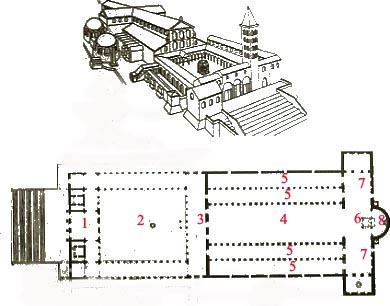 (please see Stokstad page 298 Elements of Architecture: Basilica-Plan and Central-Plan Churches)The basilican plan is initially a wide open space that was designed to accomodate large group of people. It formed in a square or rectangular form that contains a large inner space. At one end of the basilica is usually an apse which is a large half circle mebedded in the wall and usually contains a statue or altar. Notice it's similarity to the plan of theParthenon's plan. 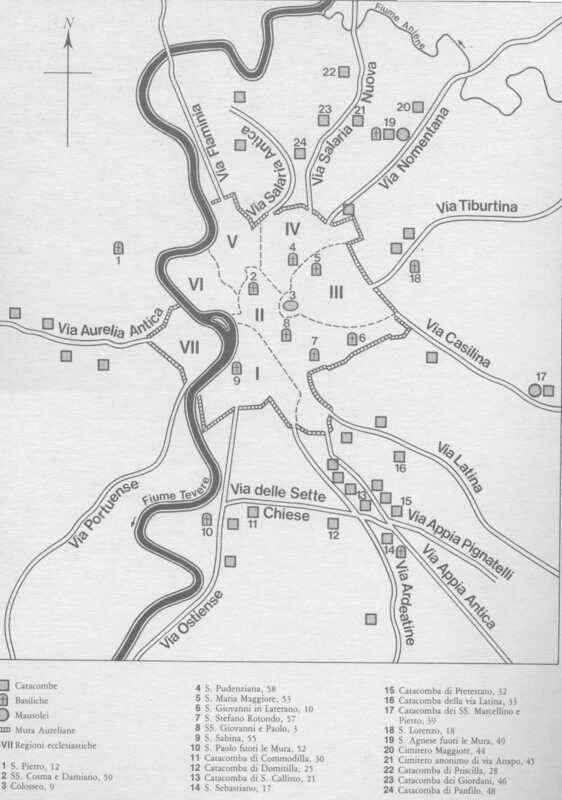 For Christian or Catholic basilican plans, like the Parthenon, St. Peters is also oriented towards the east. For liturgical purposes the apse always faces east. The apse was also important because it housed the Christian relics and the altar was placed in the apse. "Basilica" is a Greek word meaning "honored" and it is possible that for this reason one of the most used architectural form is the basilican plan which was used in the design of Christian churches. apse- the area where the relics are stored and where the altar stands. The term literally means "half wheel." nave- this is the center of the structure. The word has its root in the Greek or Latin word meaning ship. atrium- this is a courtyard/waiting area. It serves as a type of buffer zone between the secular and spiritual world. It is a carry over from Greek and Roman home architecture. Context: This section is quoted fromhttp://www2.trincoll.edu/~mzimmerm/zimmerman/Chapter4/bascon.htmlThe Basilica of Constantine was begun by his predecessor, Maxentius, in 306 AD, directly at the start of his rule, but which again was not completed until after Constantine had seized power, so therefore it bears his name. 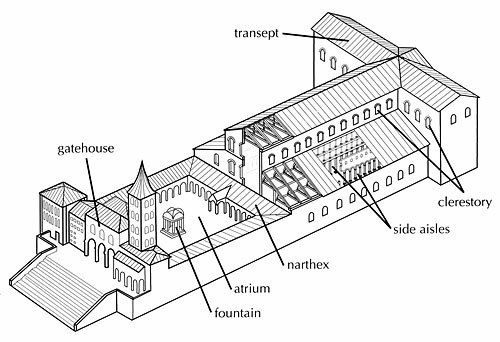 Originally, the basilica opened up onto the Colosseum, but under Constantine, this was changed, and the entrance was placed facing the Sacra Via. Combining both Hadrianic and pre-Hadrianic architecture, the basilica retains the same basic plan as does the Basilica Julia, but with a series of barrel vaults on both sides, and two large apses, perpendicular to one another, for the seating of the judges. Form: This massive building is built in a typical baslican floor plan but departs from that schema in its use of barrel vaults over the sde aisles and intersecting groin vaults over the nave. 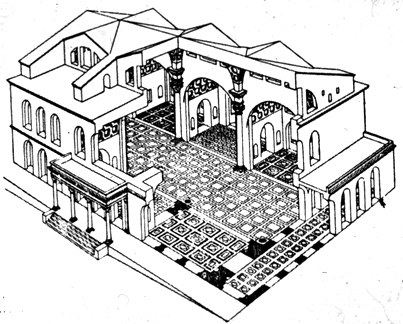 This sdesign is in some ways closer to the design of the Baths of Caralla 216 CE. The raised nave allows light to fill the vaulted area and the use of the groin vaults creates a large open space. This basilloica also departs from the basic basilican plan because it has two apses because the entrance was moved. The interior surfaces of the walls were lavishly decorated with veneers of different colored marble and mosaics. Iconography: The basilican form is a time honored form that derives its intitial inspiration from the Parthenon. The the word basilicais Greek and means "honored." Constantine's victory is symbolized by fact that this building was no longer in Maxentius's possesion. 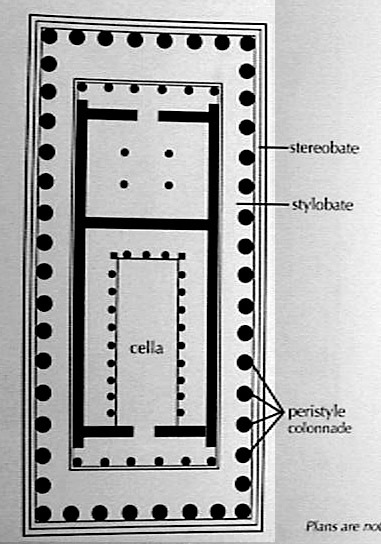 His redocoration and altering of the structure is also a symbolic gesture made concrete by the structure itself..
(quoted directly from Dr. Farber's Website) 1) Propylaeum- the entrance building of a sacred precinct, whether church or imperial palace. 7) Transept- in a cruciform church, the whole arm set at right angles to the nave. Note that the transept appears infrequently in Early Christian churches. Old St. Peter's is one of the few example of a basilica with a transept from this period. The transept would not become a standard component of the Christian church until the Carolingian period. 8) Apse- a recess, sometimes rectangular but usually semicircular, in the wall at the end of a Roman basilica or Christian church. 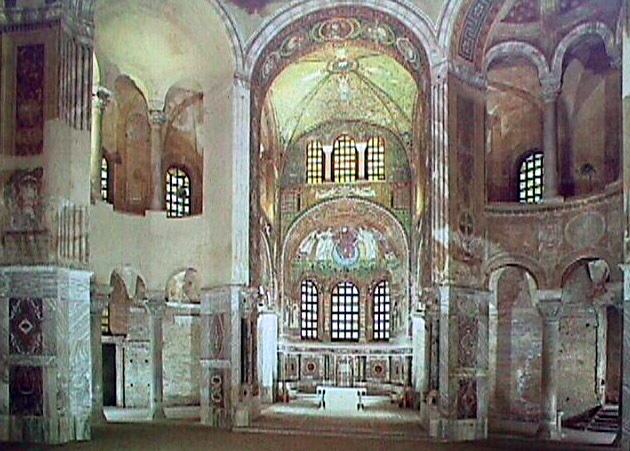 The apse in the Roman basilica frequently contained an image of the Emperor and was where the magistrate dispensed laws. In the Early Christian basilica, the apses contained the "cathedra" or throne of the bishop and the altar. 9) Nave elevation- term which refers to the division of the nave wall into various levels. 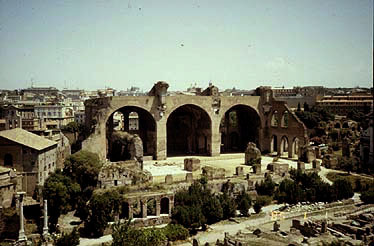 In the Early Christian basilica the nave elevation usually is composed of a nave colonnade or arcade and clerestory. 10) Clerestory- a clear story, i.e. a row of windows in the upper part of a wall. In churches, the clerestory windows above the roofs of the side aisles permit direct illumination of the nave. NOTE: The chapter on Byzantine art in Stokstad is excellent and this section of the on-line textbook is a little skimpy so make sure you read it! Form: This is a central-plan design that expands on the original basilican design. The design incorporates the use of pendentives, buttressing half domes, and arch and dome technology creating a large many storied central area. Expands on the concept, engineering and design function of the Pantheon by adding cross vaulting technology that the Romans had developed. 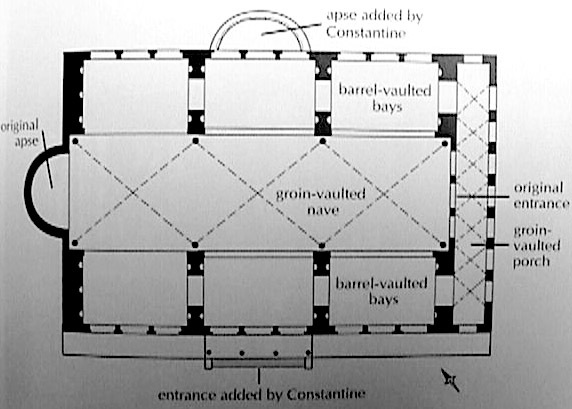 A good example of this cross vaulting technology is in the Basilica of Constantine. Decorative forms (in terms of two-dimensional designs) inside the Hagia Sofia reflect early Byzantine Style, which means that even up to the 1300's they are still using many of the same things in the Hagia Sofia to depict people. 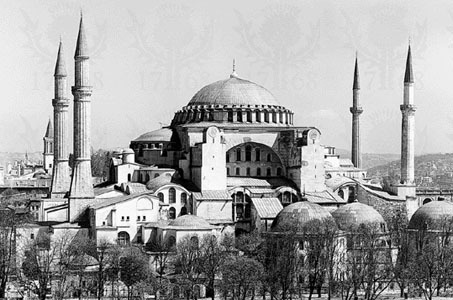 Iconography: The name Hagia Sofia can be translated as "Holy Wisdom." The plan has the form of a Greek cross surmounted by a dome which as in the Pantheon is a symbol of the dome of heaven. The engineering used is also symbolic of the power and intelligence of Constantine's empire. 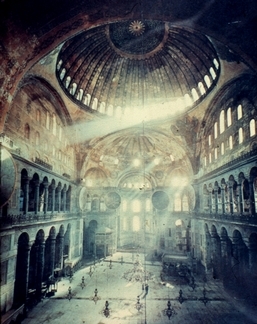 Context: The geographic location of Hagia Sofia places it in the region of Byzantium. The city where they moved the empire to is called Constantinople that is in modern day Turkey, and is also now called Istanbul. The four minarets that surround it were built later. They were added by the Muslims to them to call the faithful to worship after the church was transformed into a mosque. A mosque is an Islamic place of worship. The ornamentation of the interior is Islamic looking. For more details of images at Hagia Sofia go here. 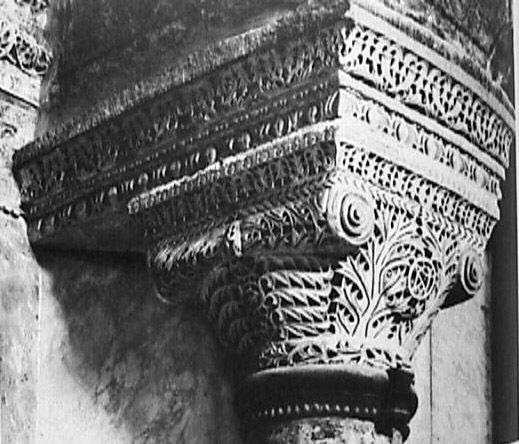 Byzantine Form: This capital at first appears to be an almost Corinthian capital but on closer inspection it is the correction of the original Greek and Roman orders. The designs on the capital are much more ornate and less solid looking then its predecessors. The over all intricate organic patterning and weaving of the ornamentation is abstract and overly ornate. Iconography: The organic vine like qualities refer to the symbol of Christianity as a vine that keeps spreading. In the center of the column is the monogram or initials for Justinian the emperor who commissioned the structure. The use of classical ornamentation and then the obvious changing of it is symbolic of the fusion of the Roman and Greek classic ideals wedded to the culture and decorative forms of the east as well as the iconography of Christianity. Iconography: The distortions of the anatomy are symbolic. The distortions and diagrammatic and cartoon like drapery deemphasizes the figure's naturalism and emphasizes the spiritual, intellectual and didactic aspects of the figures. Jesus is represented as a teacher and his weapon against evil is the Holy Bible or Libris Mundi (Latin: "book of the world") and his compassion. Jesus is also surrounded by a halo which symbolizes an aura of light. Possibly meant to be literally a symbol of "enlightenment." Inscribed inside the halo is the cross on which Jesus was martyred and on either side of the cross are his initials IC XC. Basically it is an acronim for his name in Greek. The acronym when promounced sounds like "ichthys" which sounds very much like the Greek word for fish. Hence the fish symbols on either side of his head. Context: The Byzantine style, although centered around the geographic region of Constantine's Byzantium, expands all through out the Christian world. It was used for manuscript and church art throughout France, Italy, Spain and the rest of Europe well into the 1400's and perhaps even later. As an artistic style it is used well into the Romanesque and Gothic periods. Even during the Renaissance there are still artists who use Byzantine drapery and facial stylization. Page with Rebecca at the Well Form: This manuscript page, made on animal skin, marks the evolution of Christian manuscript making. Manuscripts combined two forms of art, calligraphy and painting. The term calligraphy literally means beautiful writing (kalos: beauty graphos: to write) The letters and words are written in silver (now tarnished black) in Greek and follow a fairly unified style of script without much of the variation and ornamentation that develops later in Christian and Islamic manuscripts.The page was conceived of as a whole composition in which the words at the top, packed tightly and uniformly across the surface, balance with the almost frieze like image beneath. The narrative beneath starts at the left and continues around in a reversed "C" like shape. Multiple scenes with the same characters inhabit the same space. This convention referred to as a continuous narrative, run throughout the entire manuscript and mimic the paintings of Dura Europos. Since Jews and Christians share in many of the ideas expressed in the Old Testament, one of the concepts they share is the second commandment which forbids the creation of graven images. Early Jews and Christians took this commandment quite literally and did not create any such sculptures or images. The rational was that image making could lead to idolatry. Some Jewish groups and Christians felt that the word graven indicated a ban on sculptural images but both graphic ones. Christians were split over this decision but came on a comprise in which images were useful because they instructed. This controversy is called the iconoclastic controversy (see Stokstad "Iconoclasm" page 309). This may account for the deliberate stylizations and lack of naturalism of the figures that is similar to the relief sculptures on the Arch of Constantine. Mount Sinai, Egypt Form: This encaustic painting (wax and pigments) is symmetrical in its composition. The painting also combines several styles of painting faces and bodies. 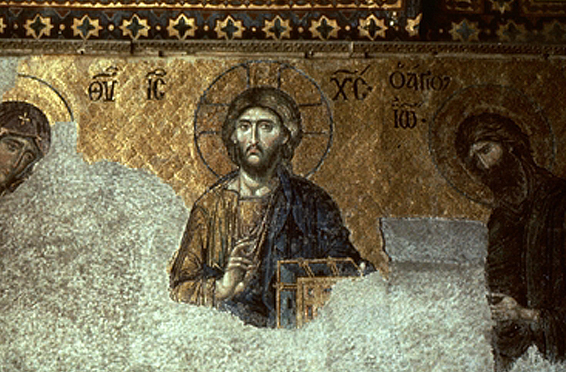 The central figures are painted in a slightly more naturalistic Graeco Roman style while the two figures of Theodore (left) and George (right) are painted in a more Byzantine and codified manner. There are more tonal transitions on the faces and bodies of the Virgin and Jesus and that the anatomy is revealed more by the drapery than in the flanking figures.Iconography: The symmetry of the composition places the most important figures at the center. Icons like this begin the tradition of creating the symbolic system in which Mary serves as the throne of God referred to by Stokstad as an intercessor and the Throne of Wisdom. The halos each wears are derived from the ideas of enlightenment they represent. A halo is a graphic representation of the light or aura of wisdom or knowledge that sacred individuals exhibit. The halos are often differentiated almost as if to give a rank. For example, Jesus' halo is inscribed with a Greek cross. Her clothing is both Jewish and eastern in style which precedes the invention of the Muslim Hijab but looks very much like it. The clothing, organization of the composition and use of halos sets the standard for costuming and depictions of Mary and Jesus well into the Renaissance. The two flanking figures are idealized types and one would have to be told how to identify them to know who they are. Nevertheless, their attributions as Theodore (left) and George (right) are the warrior saints who slew serpents similar to the one that Adam and Eve were tricked by. Form: This central plan structure has an octagonal shape and two levels. The arches walls and floors are all covered with ornate and intricate Byzantine style mosaic and tile work. 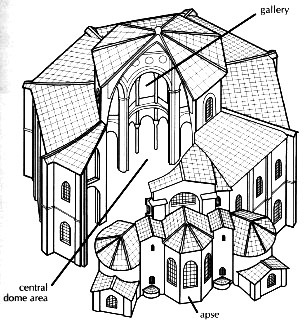 Arches and some vaulting are used and the center even has a dome, which from the exterior looks like an octagons full of windows that flood the interior with light. Eight large piers alternate with columned niches to define precisely the central space and to create a many layered design. 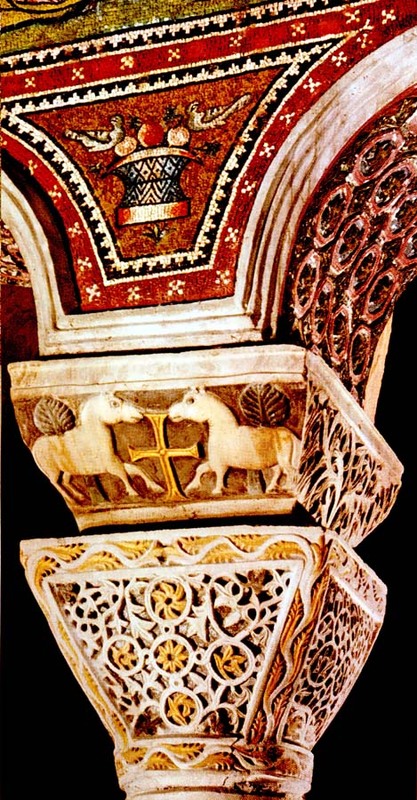 Nevertheless, the technology used to construct San Vitale is not quite as advanced as Hagia Sophia although the walls were lightened by the use of hollow pots in its interior.Iconography: San Vitale reflects Byzantine influence and technological creativity. St. Vitale is the major Justinian monument in the West. It was probably built as a testament to the power of Orthodoxy in the declining kingdom of the Ostrogoths. He tries to establish a place where there are severe Christian Churches (people were forced to convert to Christianity). Context: On the second level of the ambulatory, is a special gallery reserved for women. This was a typical custom of Jewish religious worship. The reason for this, was to segregate the males from the females in order for them to pray with greater devotion. 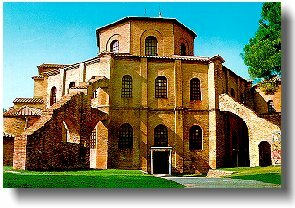 For more details of San Vitale go here. 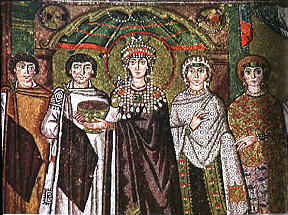 Empress Theodora and Her Attendants. Form: The interior of St. Vitale, is similar to the Pantheon and Hagia Sophia. The design includes an enormous amount of different colored marble and all the other surfaces are decorated with mosaic or tile. The ornamentation in the church's interior looks Islamic or Arabic although it predates Islam. 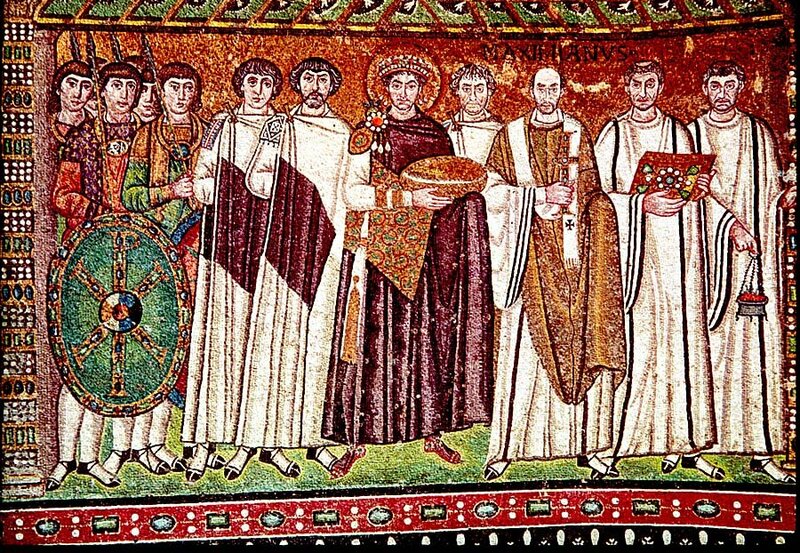 The figures are stylized in a typical Byzantine mode. The heads are too large and the bodies are covered completely with drapery that does not reveal the anatomy beneath. It also shares some elements from the Arch of Constantine, the heads are big and there's no Contrapposto (liberal movement in figures). The facial anatomy is stylized. The face is also elongated and the nose meets the bridge of the brows and the eyebrows actually go directly into the nose. These are some of the elements that become standardized in Byzantine Manuscript. 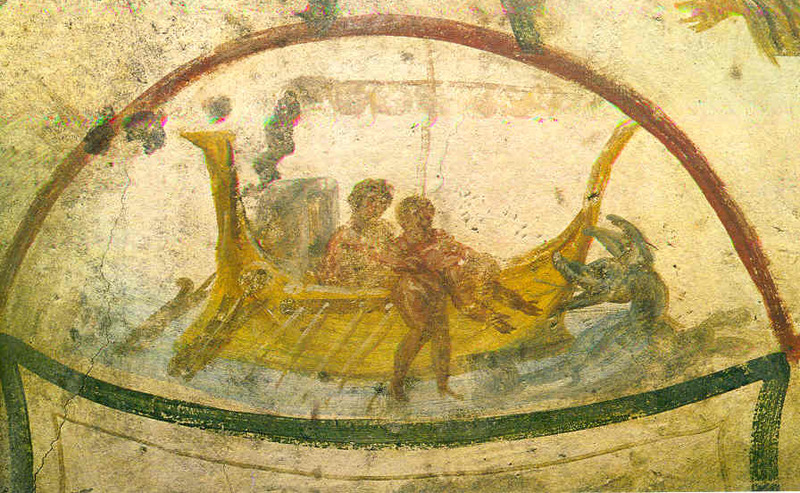 Stokstad discusses the reverse perspective of the image which basically is a denial of the illusionistic systems of Roman art that are apparent in the mosaics and frescoes of Pompeii. Chi-Rho n, pl Chi-Rhos [chi + rho] (1868): a Christian monogram and symbol formed from the first two letters X and P of the Greek word for Christ--called also Christogram What is Chi Ro? Chi Ro, pronounced (KI ROW), is probably the oldest monogram used for the name of Christ. It was found written along the walls of the catacombs, which were the cemeteries of the early Christians and also a place where they held their secret meetings. The Chi and Ro are the first two letters in the Greek word for Christ. Our CH was one letter in Greek and was shaped like our X. The Greek R had the shape of our P. By combining the RO or P to one arm of the Chi we get XP. As a pre- Christian symbol, the Chi Ro signified good fortune. The Chi Ro became an important Christian symbol when adopted by the Roman Emperor Constantine, representing the first two letters in the name Christ. According to Church Father Eusebius, on the eve of the Battle of Milvan Bridge, the Emperor saw the emblem in a dream, with the inscription "With this symbol, you shall conquer." According to the story, the battle was won. 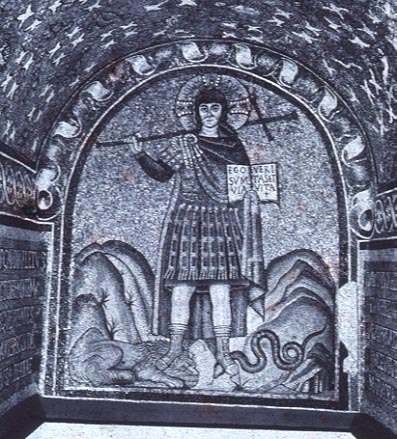 In return for the victory, Constantine erected Christian Churches. The symbol was the standard of the Emperor's army, prominently displayed on the Emperor's labarum, or battle standard. For his spiritual power he has the members of the clergy on his left. Directly to his left is the archbishop Maximus whose face is almost as defined and unique as Justinian's. 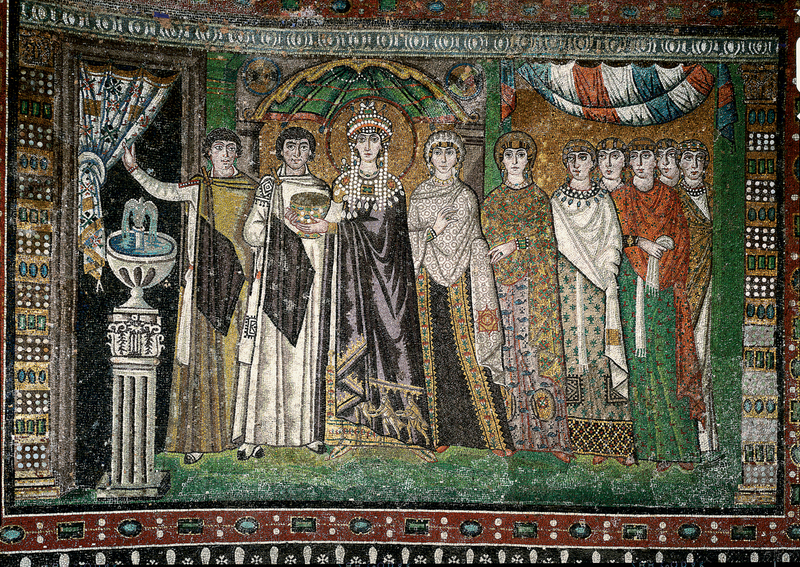 Theodora is surrounded by her ladies in waiting and the local clergy as well and Theodora holds the wine which symbolizes the blood of christ. On her gown is an image of the three Magi carrying their gift to the newborn Jesus. Both are wearing royal purple and both are placed at the center of the image. 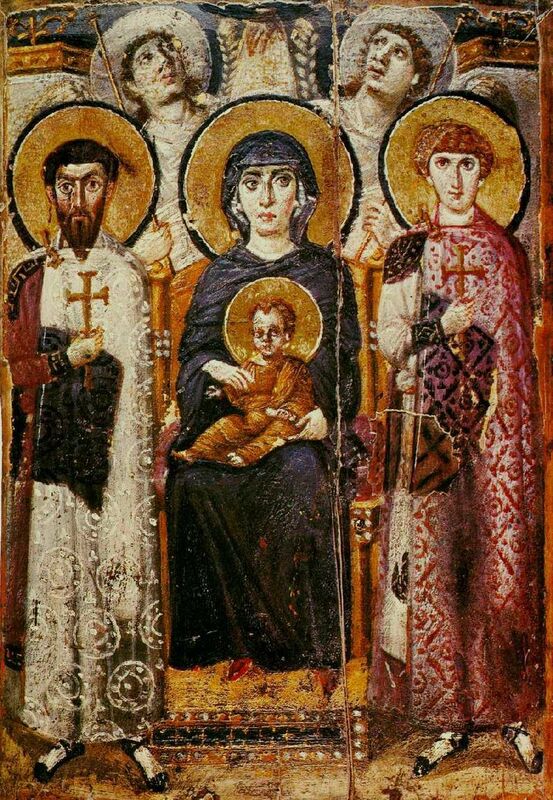 The placement and the icons they carry and wear were meant to communicate to the viewer that the emperor and empress were the church and the only path to salvation. This links theological and political power as a single theocratic unit. Byzantine Style Form: This capital at first appears to be an almost Tuscan or Doric capital but on closer inspection it is the correction of the original Greek and Roman orders. Between the arch and the capital is an additional structure called an impost block. The designs on the capital are much more ornate and less solid looking then its predecessors and combines carving, polychroming and mosaic. The over all intricate organic patterning and weaving of the ornamentation is abstract and overly ornate. Iconography: The organic vine like qualities refer to the symbol of Christianity as a vine that keeps spreading. 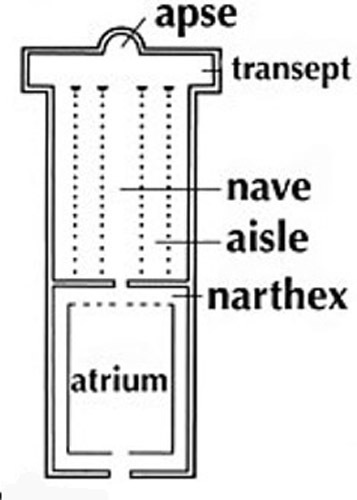 In the center of the column's capital and impost block are cruciform symbols. 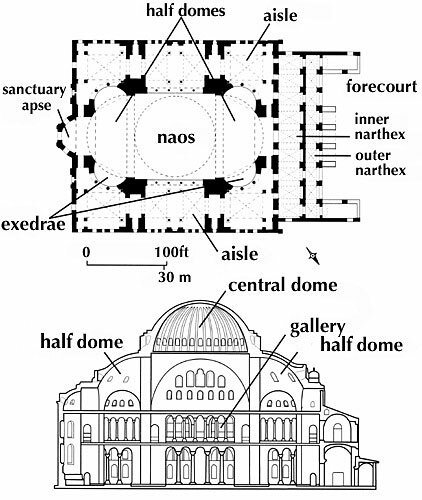 Notice on the capital, the Greek cross formed of four circles that looks like the domed greek cross plan discussed on page 324 The Elements of Architecture, Multiple-Dome Church Plans. The use of classical ornamentation and then the obvious changing of it is symbolic of the fusion of the Roman and Greek classic ideals wedded to the culture and decorative forms of the east as well as the iconography of Christianity. notice that Jesus is now a Christian soldier and defender. S. Gall Benedictine Abbey, St. Gall Switzerland 7th-8th C The Monastic System fulfilled the needs and took care of the people. It educated the Lords and the Serfs. The Monks kept the world going by praying, and they were very intelligent. The Monk Monasteries were like Universities, they were a place to learn spiritual renewal and a place to pray. They would also copy the Bible and make manuscript. They preserved some of the text that would have otherwise been burned. In the Monastery the servants slept next to the livestock. There was a big church at the entrance with statues of Gabriel and Michael (Archangels). 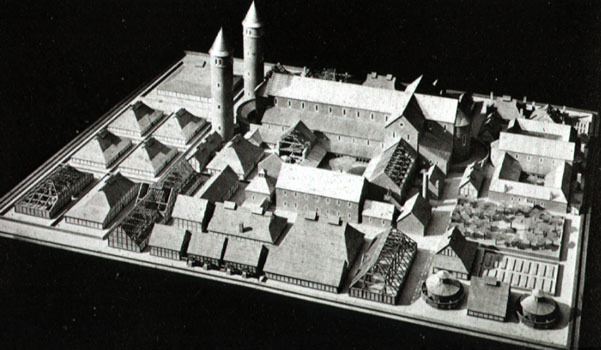 The Monastery also included a hospice for the poor (a free clinic) where a medieval physician would bleed you. There was also a physicians house. There were breweries and bakeries etc. next to the kitchen. There was a caretakers house and a cemetery. In the middle there was a cloister, a courtyard where you go to reflect on the life of God. There was also a guest house and a school. There was a novitiate house (convent for the novices) for people who were thinking of becoming Monks and Nuns. Political and Theological Systems570 or 580 AD- Pope Gregory comes to power. Everyone is worried because they are moving to a new century. He tries to save as many souls as possible. Some of the things that Pope Gregory does is to codify or systematize worship and the liturgy of the church. One such system was Gregorian Chant. Gregorian chant, monophonic, or unison, liturgical music of the Roman Catholic Church, used to accompany the text of the mass and the canonical hours, or divine office. Gregorian chant is named after St. Gregory I the Great, pope from 590 to 604. It was collected and codified during his reign. Charlemagne, king of the Franks (768-814), imposed Gregorian chant on his kingdom, where another liturgical tradition--the Gallican chant--was in common use. During the 8th and 9th centuries, a process of assimilation took place between Gallican and Gregorian chants; and it is the chant in this evolved form that has come down to the present. The Ordinary of the mass includes those texts that remain the same for each mass. The chant of the Kyrie ranges from neumatic (patterns of one to four notes per syllable) to melismatic (unlimited notes per syllable) styles. The Gloria appeared in the 7th century. The psalmodic recitation, i.e., using salm tones, simple formulas for the intoned reciting of psalms, of early Glorias attests to their ancient origin. Later Gloria chants are neumatic. The melodies of the Credo, accepted into the mass about the 11th century, resemble psalm tones. The Sanctus and Benedictus are probably from apostolic times. The usual Sanctus chants are neumatic. The Agnus Dei was brought into the Latin mass from the Eastern Church in the 7th century and is basically in neumatic style. The concluding Ite Missa Est and its substitute Benedicamus Domino usually use the melody of the opening Kyrie. The Proper of the mass is composed of texts that vary for each mass in order to bring out the significance of each feast or season. The Introit is a processional chant that was originally a psalm with a refrain sung between verses. By the 9th century it had received its present form: refrain in a neumatic style--a psalm verse in psalm-tone style--refrain repeated. The Gradual, introduced in the 4th century, also developed from a refrain between psalm verses. Later it became: opening melody (chorus)--psalm verse or verses in a virtuosically embellished psalmodic structure (soloist)--opening melody (chorus), repeated in whole or in part. The Alleluia is of 4th-century Eastern origin. Its structure is somewhat like that of the Gradual. The Tract replaces the Alleluia in penitential times. This chant is a descendant of synagogue music. The sequence flourished primarily from about the 9th century to the 16th. In its modern form the texts are sacred poems with double-line stanzas having the same accentuation and number of syllables for each two lines. The melody of the first line was repeated for the second line of then stanza, a new melody being given to the next stanza; the music is syllabic. The Offertory originally consisted of a psalm and refrain, but by the 12th century only the refrain remained. The music is quite melismatic. Peculiar to the Offertory is repetition of text. The Communion is, like the Offertory, a processional chant. The music is neumatic in style. The canonical hours consist of eight prayer services: Matins, Lauds, Prime, Terce, Sext, None, Vespers, and Compline. Each includes antiphons or refrains, short texts that precede or follow each psalm and are set mostly in syllabic chant; psalms, with each set to a psalm tone; hymns, usually metrical and in strophes or stanzas, and set in a neumatic style; responsories, which follow the lessons of Matins and the chapter, a brief lesson of the other hours, and have the form response- salm verse-partially or entirely repeated response. The responsory is related to the form and style of the Gradual. St. Augustine-theologen who wrote about man's relationship with God system to understand philosophical structure-spiritual world and physical world are tied together. Greek Orthodox Church exists in Constantinople and the Roman Catholic Church lives in Rome, Italy. Everybody believes in the ten commandments, that Jesus has come to save them and that he died for our sins. This is a theology everybody has come to accept, except for the Jews and Islamics. The beginning of some of the problems that they have is that they start reading different doctrine and different ways of worshiping into that and that changes what people think. In the Greek Orthodox church they speak Latin, only because it's a trade language. Feudalism- Starts at almost 600-700 A.D. Feudalism was a system of military service and land ownership that created a pyramid of political and military power. Feudalism is a system of government in which the minority rules the majority. For every Lord there are 60 to 70 Serfs. It called for support mostly from the church and included mainly little kingdoms run by Landlords-kings. It did not rely on one single dictator or person to run the empire. During or about this time Monasteries were also built . They served as universities, hospitals, library, training schools for future monks, public shelter, and many other purposed. These same monasteries also were responsible for preserving many important documents that are so vital in today's history. If it weren't for them we may have not seen many of the documents that have provided us with many important information about history. In around 500-600 AD there was a breakdown in the pre-established Roman order which had dominated Europe and the Near East. Feudalism came to the fore and cities, as we know them, disappeared. The Church at this time became the central repository of classical knowledge. When Charlemagne, in the late 700 to early 800's attempted to centralize the "Holy Roman Empire," the churches he built also served as a kind of palace/throne room. The architecture of these structures is not as sophisticated or ornamented as earlier basilica. Another great achievement of the middle ages was the rise monasticism. The monastery was almost a great fortress of information. 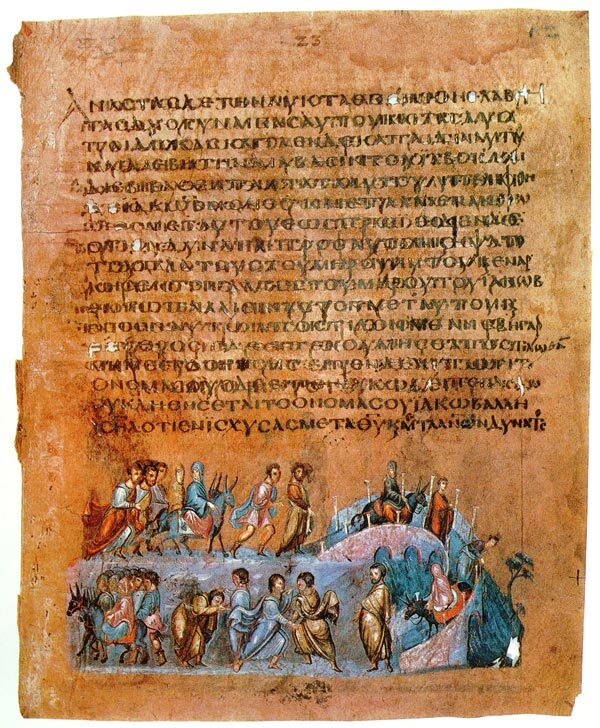 Scribes and scholars housed in monasteries were basically responsible for transcribing and storing the information of classical antiquity and later philosophers and theologians. One of the main products or art forms the monks produced was the illuminated manuscript. showing the burial niches or loculi. 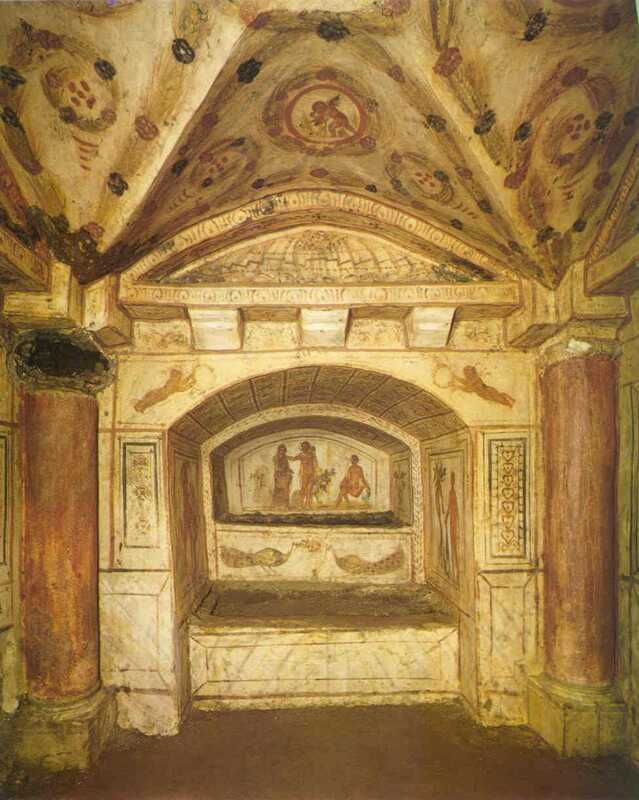 The Roman catacombs are comprised of 36 separate Christian sites and several pagan and Jewish sites located around the old pomerium, or sacred boundary of the city. As any guide will tell you, these were meant exclusively as places of burial, and only later did the practice of conducting liturgies grow up around the graves of the martyrs. The tradition that these were places of refuge for the Roman Christians in times of active persecution is persistent, but no evidence survives to support this romantic notion. They were excavated and utilized for a little over two hundred years, from about A.D. 150 until the later fourth century. Experts estimate that between 60 and 90 miles of galleries were dug by professional fossores, who served as both tunnelers and guides to visiting families and pilgrims. While actively in use between 500,000 and 750,000 Christian dead may have been buried in the loculi (niches),arcosolia (sarcofaghi surmounted by an arch) and cubicula(family mausolea). Many of these latter were decorated with frescoes on plaster depicting a range of subjects, and this art is a most precious relic of the early Christian community. Only a few of these sites are open to the public today, and access is generally limited. One of the great threats to these sites is human breath with its high humidity and potential for weakening or destroying the frescoes. both tunnelers and guides to visiting families and pilgrims. While actively in use between 500,000 and 750,000 Christian dead may have been buried in the loculi (niches), arcosolia (sarcofaghi surmounted by an arch) and cubicula(family mausolea). Many of these latter were decorated with frescoes on plaster depicting a range of subjects, and this art is a most precious relic of the early Christian community. Only a few of these sites are open to the public today, and access is generally limited. One of the great threats to these sites is human breath with its high humidity and potential for weakening or destroying the frescoes. In the decades after the establishment of the Christian religion in the Roman capital by Saints Peter and Paul, Christians began burying their dead as a community in ground that belonged to relatively wealthy members of the congregations. Unlike the pagans who often cremated their dead, Christians interred theirs without destroying the body, in whose ultimate resurrection they firmly believed. After several generations the top layer of the soil became filled with corpses, andChristians turned to excavating beneath the surface layer to create more room. The earliest known example of this was the catacomb known as Domatilla, dating from about A.D. 150 and named after the woman on whose land it was excavated. Most are similarly named and only one, St. Callixtus, was owned by the Christian community, or church, from the outset. The name catacomb derives from the name of the location of San Sebastian, about a mile beyond the great gateway that also bears the martyr's name. Ad catacumbas referred to the hollow in which the church and burial area were located, and as this was the only such site that remained known and open to Romans and pilgrims throughout the middle ages, the name stuck and came to be applied to all such underground burial areas. occupation, as with this example of a carpenter's or mason's compass andplumb-bob integrated with the symbols of fish and anchor, both representing Jesus Christ. For the illiterate, other symbols such as coins or medallions or even small toys might be embedded in the soft mortar to identify the inhabitant. When the Emperor Constantine legalized Christianity in the early fourth century, he and other Christians began building permanent structures for worship in the city, and began transferring bones from the catacombs to these new centers of the Christian communities. 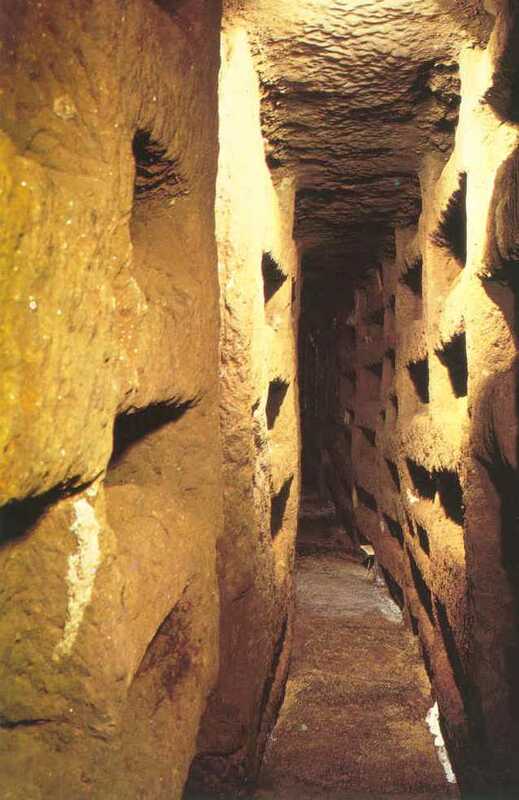 Burials in the catacombs themselves ceased in the later fourth century. Pope Damasus (366-384) revered these sites and spent precious resources refurbishing them as sacred places of worship: plaques commemorating these repairs can still be seen at several of the sites. Many of the remaining human bones were transferred during the early fifth and sixth centuries when barbarians invaded the area and threatened to desecrate the underground cemeteries. Further removals occured when northern European churches and monasteries requested the earthly remains of early Christian saints, and acquiescent bishops of Rome filled their orders. 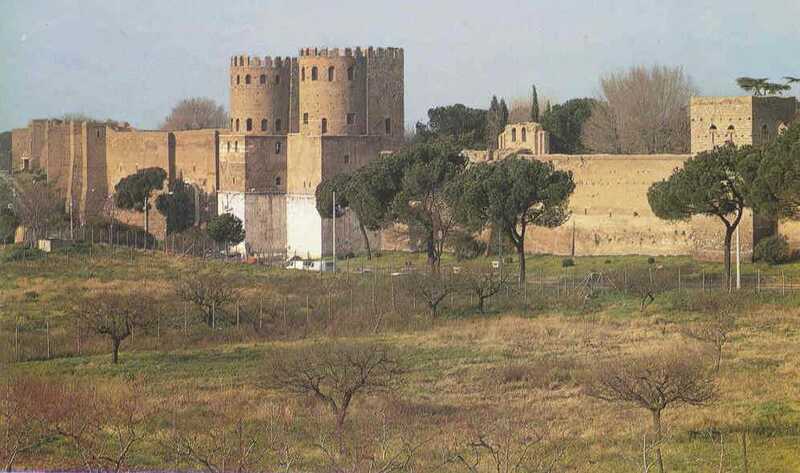 Under Pope Hadrian (772-795) many were again restored for visitation by pilgrims. 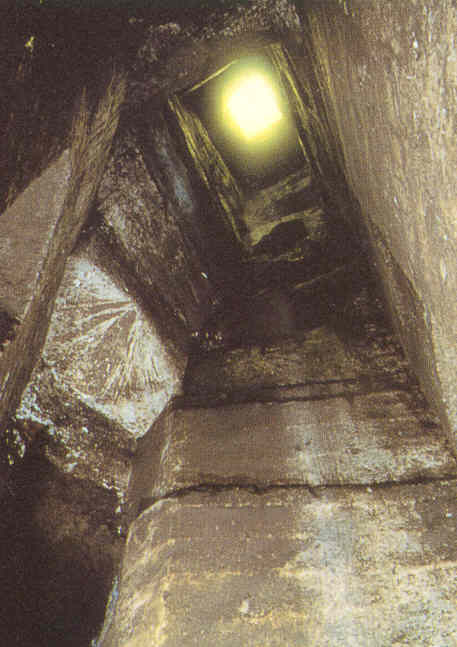 By the tenth century most of the sites had been emptied, abandoned and their light shafts used as waste pits. Only San Sebastiano ad catacumbas remained a place of pilgrimage and worship. Romans began to rediscover their lost history during the fifteenth and sixteenth centuries as early archaeologists began excavations at nearly thirty of the sites. Antonio Bosio (1575-1629) was the most prolific of these men, and is sometimes called the Christopher Columbus of the catacombs. 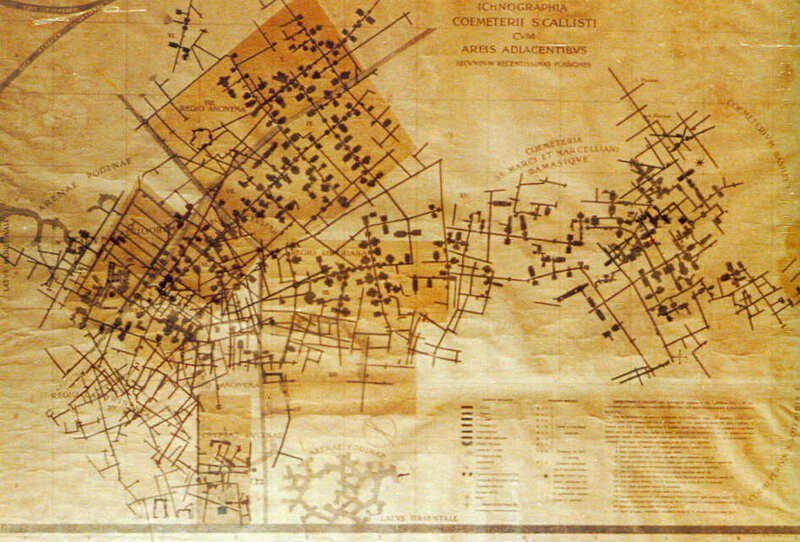 Several more were discovered in the eighteenth and nineteenth centuries, and further clearing, mapping and preservation took on a systematic flavor under the direction of Giovan Battista De Rossi and the newly formed Pontificia Commissione di Archeologia Sacra (1852). 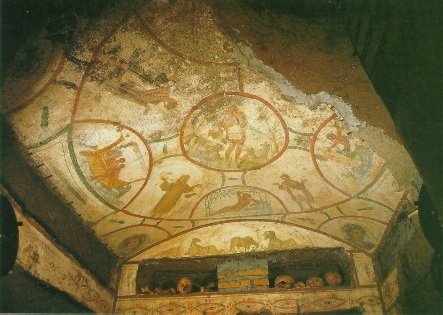 The latest and probably last catacomb to be discovered was found in Via Latina in 1955 during digging for construction. In some ways it is the best preserved of the lot. 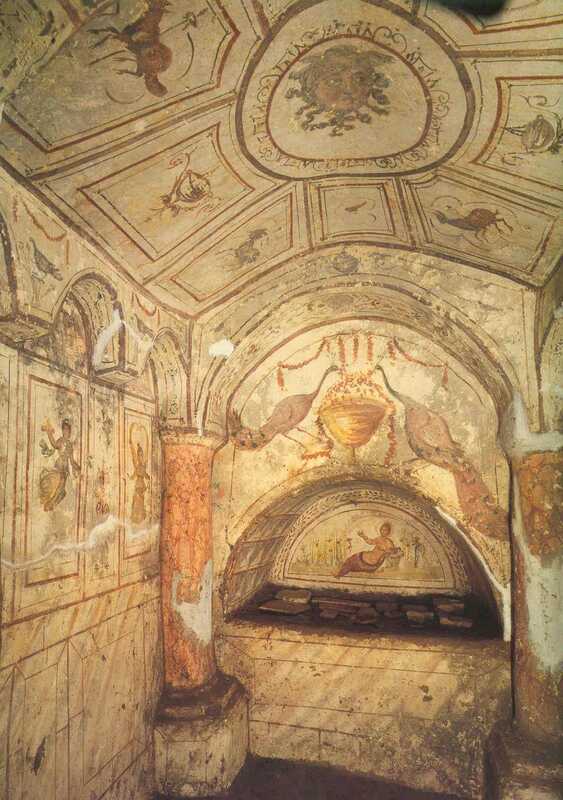 The catacombs of Rome contain the single most precious collection of early Christian art in the world. 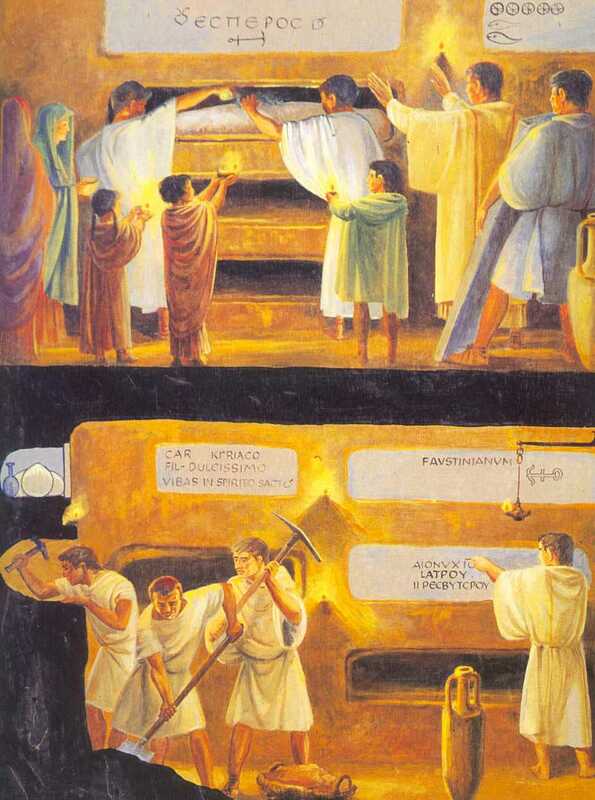 In burying their dead, the early Christians provided frescoes and other artistic expressions that reflected their beliefs in their God, in the resurrection of the dead, and of the hope they shared for their loved ones and themselves. The creators of this art remain anonymous, and some think the fossores may have had a hand. It varies in quality from mere graffiti to sensitive and clearly professional painting that rivals any Roman examples known. Imagery ranges from mere decoration to simple symbols (fish, anchors, grapes, birds) to figures of the deceased praying (the orantes figures) to scenes from the old and new testaments. One may safely surmise that the wealthier families provided the richer decorations. Some decorations, as here in San Sebastiano, reflect the secular art of the day. These rather simple delineations are from the so-called Villa Piccola and demonstrate a style datable to about A.D. 230 - 240. Plaster was first spread over the rough surface and the paint applied either while the plaster was still wet, or fter it had dried. Fragmentary remains of a similar nature can be found in many cubicula and some arcosolia. 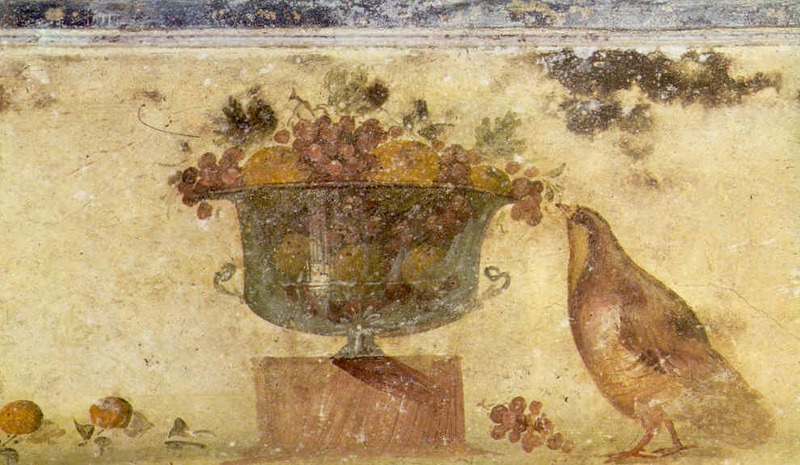 Around the arcosolium below (Via Latina, Cubiculum E) we see a pair of birds dominating one part of the composition. Birds might stand for the dove of peace from the story of Noah or the appearance of the Holy Spirit in the form of a dove. From ancient times the bird also represented the human soul. These peacocks were specifically symbols of eternal life, and thus of Christ or Christ's promise, for people believed that their flesh did not decay -- despite the daily opportunity to test this belief. In this context, however, the meaning is blurred, as no other purely Christian imagery is displayed, and several clearly pagan figures do appear: the Winged Victory to the left, the gorgon on the ceiling and the reclining Tellus, goddess of the earth and flowers. 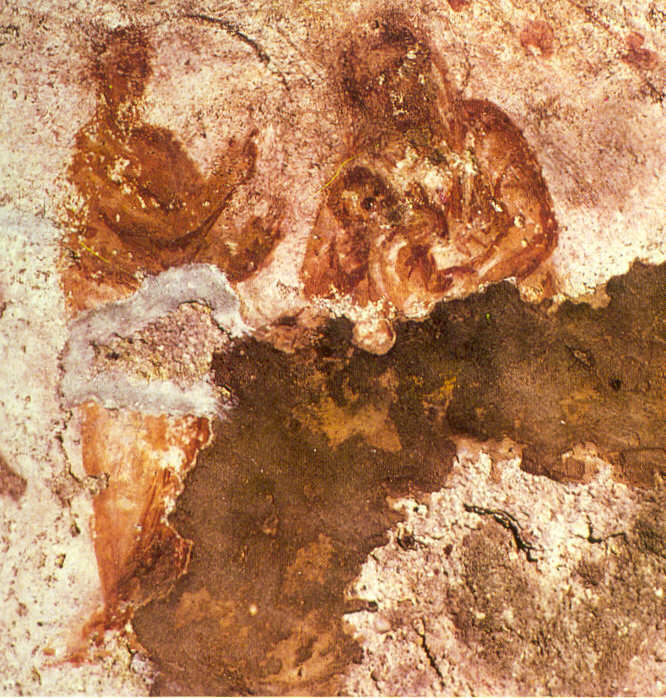 The goat kids on the ceiling could represent Christ, as the "scape goat" sacrificed for the Hebrew people. The gorgon might represent the reconciliation of opposites (death and eternal life?) and the Winged Victory the victory of Christ and the Christian over death. Such mixing of pagan and Christian meanings was not unusual, just as Christ/Orpheus and Christ/Apollo are often conflated in early Christian art. On the other hand, the grave might have belonged to a pagan, for they were sometimes buried in the catacombs. In the arcosolium the body was laid in the sarcophagus carved from the wall and had a slab (here in fragments) placed over the opening. Around this arcosolium, also in Via Latina, we again see pagan images, including winged putti and the heroic Hercules. Over the peacocks we see Hercules returning Alcestis to the world from Hades. Despite being a pagan god, Hercules also was a figure of high moral standing in the Roman world, and his stories may well have been sources of moral examples for even Christian Romans. Even with the official Roman sanctions on Christians, and active persecutions, much of Roman secular culture did seep into Christian culture, as any student of patristics or early art knows well. It was not a matter of beliefs, but of expression and idiom. On the inner left wall is Hercules battling the Hydra -- easily identifiable with sin or evil -- and to the right "The Anatomy Lesson", perhaps identifying the occupant as a physician or teacher. Praying figures, or orantes, extend their arms as did Christ on the cross: "We not only lift up our hands, but spread them out, modelling them after the Lord's passion." (Tertullian) Earlier art shows this to have been a classical form of praying, and related in art to the virtue of pietas. It may be assumed that the figure is the deceased, praying before the throne of God on behalf of loved ones left behind. Inscriptions seem to bear this out: "Atticus: sleep inpeace, secure in thy safety, and pray anxiously for our sins;" "Pray for thy parents, Matronata Matrona. She lived one year and 51 days." Others found in this pose include Hebrew figures such as Daniel and the three boys in the fiery furnace: characters who were protected in their hour of need by a gracious God and preserved in life. Both prayerful supplication and thanksgiving seem natural in these situations. Scenes from the Hebrew Bible tie the Christian experience to its Jewish roots and to the fulfillment of the promises God made to His early servants. The stories surrounding these men and women are not merely symbolic of the message of the Gospel of Christ, but are prefigurations of the Life of Christ and His message. 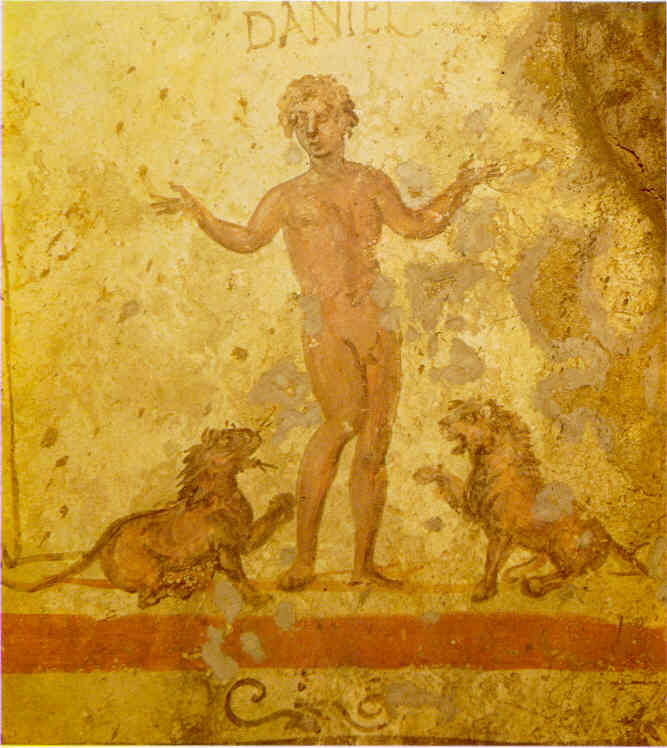 From the expulsion of Adam and Eve to the Maccabbean-era story of Daniel and the Lions, taken together the catacombs provide a visual Bible. The story of Jonah and the "whale" has been interpreted as a prefiguration of Christ's three days in the tomb and His (and the Christian's) eventual resurrection. Depictions from numerous catacombs show his being tossed into the sea, being regurgitated and in repose after his work was finished. Here a rather canine-appearing fish is about to swallow the unfortunate traveller. 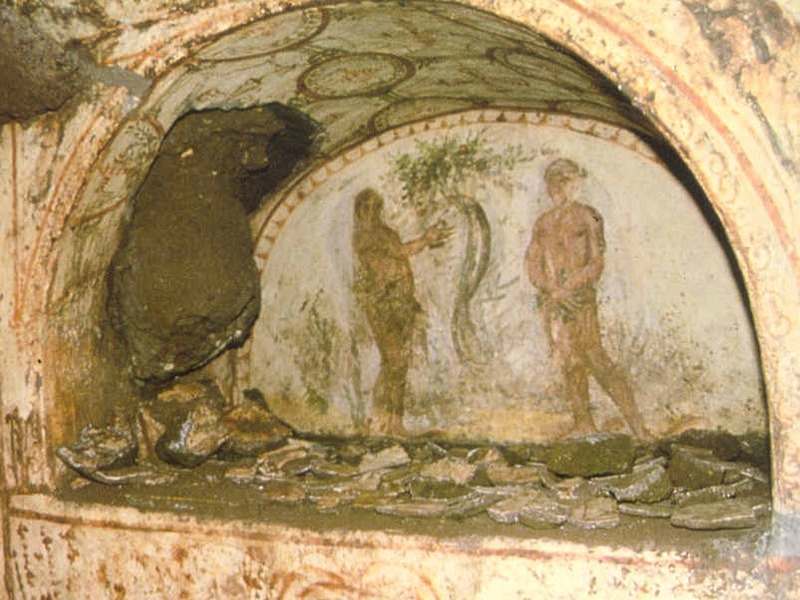 The story of the Sacrifice of Isaac by his father Abraham contains many themes of great interest to the early Christians, and finds its place in many of the catacombs. God's promise to Abraham and its fulfillment, Abraham's sorrow and obedience in carrying out God's command to sacrifice his son, Isaac's simple acquiescence, God's mercy in rewarding Abraham's obedience and the prefiguration of God's Sacrifice of His own Son on the Cross all work together in this simple image of father, son, altar and ram. 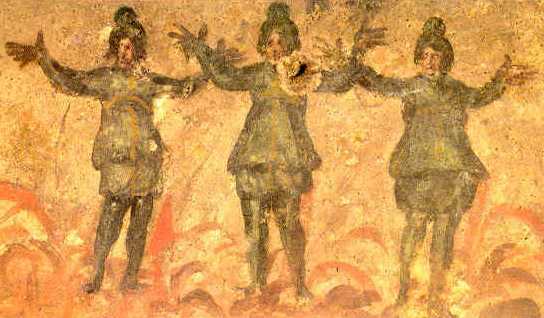 So, too, the story of the boys in the fiery furnace, here seen in the familiar orant position of prayer (Catacomb of Priscilla). Their story of persecution and faithfulness, and of God's reward for their faithfulness helped reassure those undergoing the persecutions of their own day that they, too, would be the beneficiaries of God's mercy and promise of Life. So, too, the story of Daniel in the Lion's Den: the wicked authorities persecuting the innocent believers whose only power was their faith in God and his promise to His people. Those these particular lions may not appear too threatening, those used in the Roman circuses against the Christians were all too real and spilled the real blood of contemporary believers. Even the orant pose that Daniel assumes links his persecution and salvation to those of the Christians. 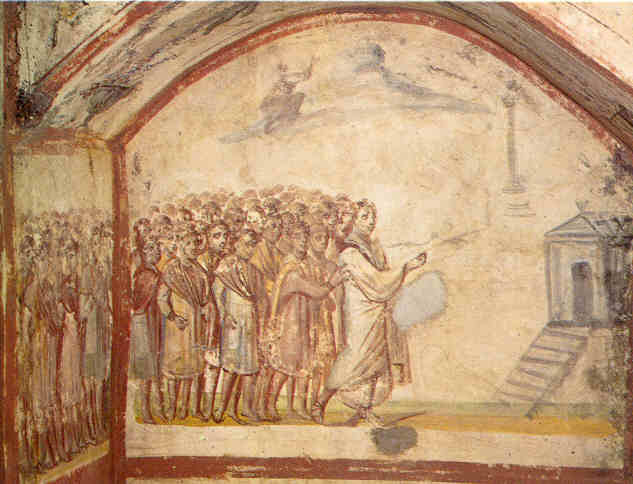 The life and miracles of Christ as depicted in the New Testament found their way onto the walls of the catacombs as well. Here was the immediate message of the Gospel, of Salvation and eternal Life for the faithful believer. Scenes range from the Annunciation to Christ in His Glory, but tend to emphasize the power of Christ over death and His continuing life among His people, especially in the Supper of the Lord, or Eucharist. 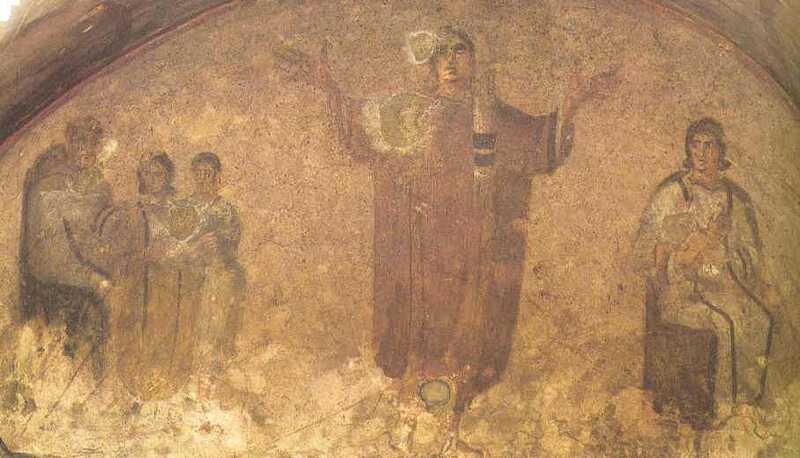 This Madonna and Child from the Catacomb of Priscilla is the oldest known representation of this most touching and human aspect of Christ's Incarnation. The emphasis on the maternal love of Mary for the Child Jesus reflects the early Christian community's reverence for the Mother of God, and for its understanding of God's love for humankind in sending His only Son to earth to share in our humanity. 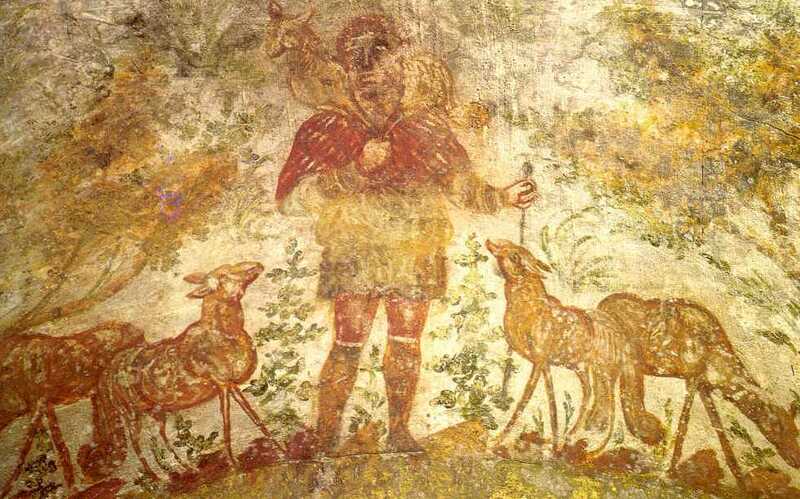 The Good Shepherd figure has firm roots in pagan antiquity, and became very popular in its application to Christ's characterization of Himself. Like a mother's love, the shepherd's concern for his flock was legendary, and helped reassure Christians of the quality of God's promise and love. 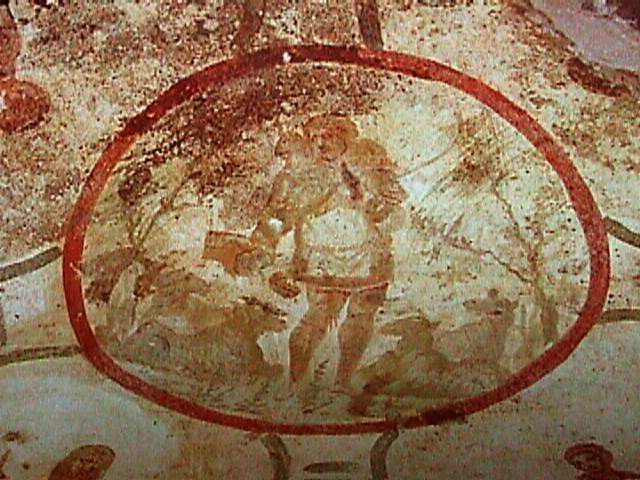 This depiction is in the Catacomb of Domatilla. The miracles of Christ that displayed to the world His divine power often included both physical and spiritual healing. 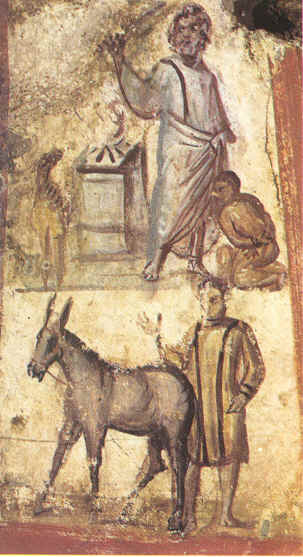 In this fresco from the Catacomb of SS. Marcellinus and Peter we see the woman with an issue of blood trying merely to touch the hem of Christ's garment in order to be healed. 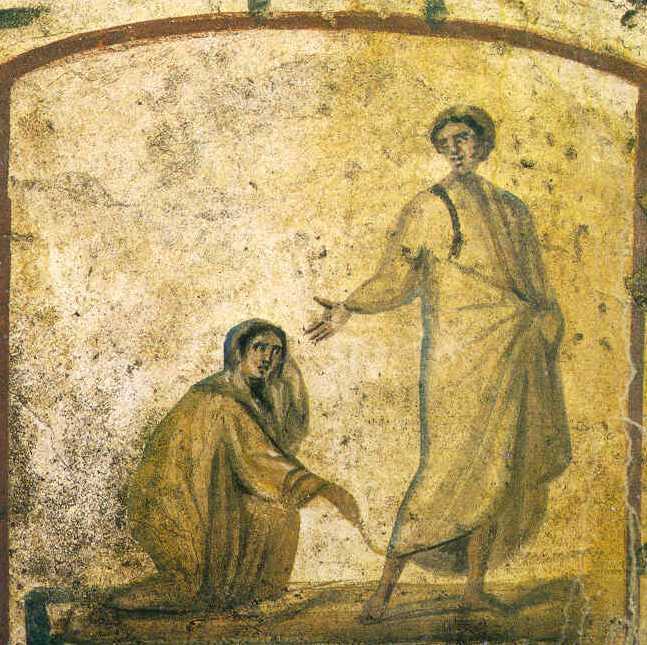 The typically unbearded Christ gestures openly to her, as if to say, "Your faith has saved you." in the catacombs of Rome. Golden Age of Pericles- 500 B.C. High Hellenistic Period- 350 B.C.- 100 B.C. Beginning of Pagan Roman Empire- 200 B.C. Roman Empire- 200 B.C.- 315 A.D. Early Christian Era- 315 A.D. - 800 A.D.
Judaism is similar to Islam in that the Jewish people are not a race but a people who share a religion and a culture. Judaism began around the time that Egypt and Mesopotamia were rising in power. It begins with a single patriarch named Abraham, who in some ways has a very similar story to the Islamic Mohammed. According to the Old Testament, the Jewish Bible called the Torah, Abraham was instructed directly by god to found a monotheist faith and nation, which would eventually become the nation of Israel (Gen. ch. 2). From Isaac, the son of Abraham, came fourth the nation of Israel (Gen. ch.21). However, Abraham also had a son with one of his servants (Gen. ch. 16). This son, Ishmael, became the father of the Arabs. Mohammed, one of his descendants, founded Islam. The Jews, like many other nations and groups, were conquered by the Roman Empire. 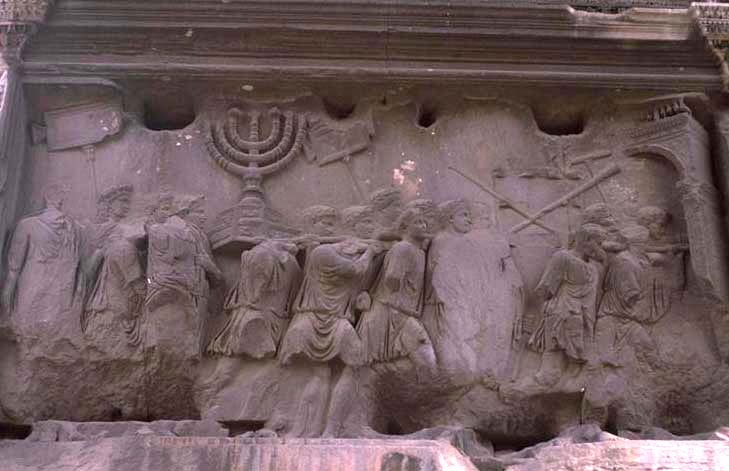 The Jews were conquered because of the tremendous force and power of the Romans but although the Jews offered cultural resistance to the hegemonic powers of the Roman Empire often they adapted and adopted some of the values of the peoples with whom they lived. Judaism and Islam also both share in many of the same laws, philosophies and even dietary restrictions. The most relevant to art is that Judaism's Second Commandment forbids the creation of graven images. The injunction against image making continued during the late 2nd Temple period to exercise a significant degree of influence on the cultural preferences of the Israelites. In fact the Greek and the Roman conquests periods that parallel the late 2nd Temple Period were pierced through by a series of high profile clashes over the use of figurative images in religious and semi-religious contexts. Such theological clashes were also often the cause or pretext for political confrontations, insurgencies or outright revolts.As of the second to third century C.E. onwards there was against all expectations, a noticeable shift/relaxation in the application of the 2nd commandment. A distinction was drawn up between images in the context of decoration and images in the context of adoration or ritual, and a greater acceptance of figurative images in a decorative context made itself felt. The change in attitude may have been partly connected to the disappearance of Israel as a physical entity. It led to a flowering of mosaic art in the synagogues of the third to the sixth centuries C.E., and in instances such as Dura Europos Synagogue and possibly others, to the introduction of images into worship itself. 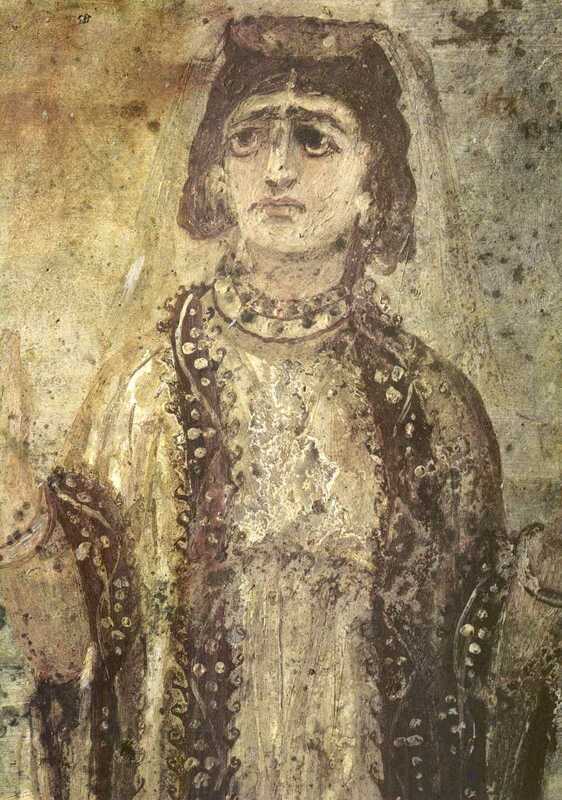 Dura Europos, Syria 244-45 CE, tempera on plaster. 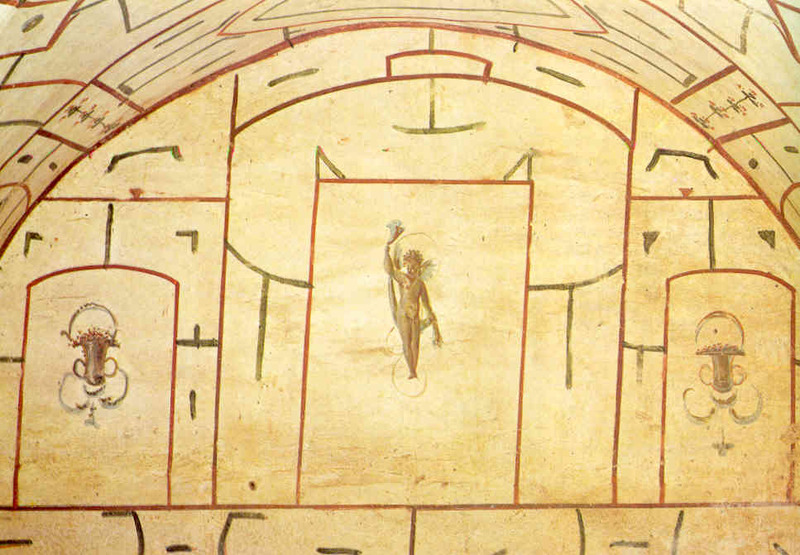 Plan of Synagogue Form: These wall paintings are not buon or true fresco painting. The paint was probably applied when the plaster was already dry with tempera paint. Tempera is a combination of ground pigments (made from minerals usually) egg and sometimes a bit of glue made from animal hide or dairy products. 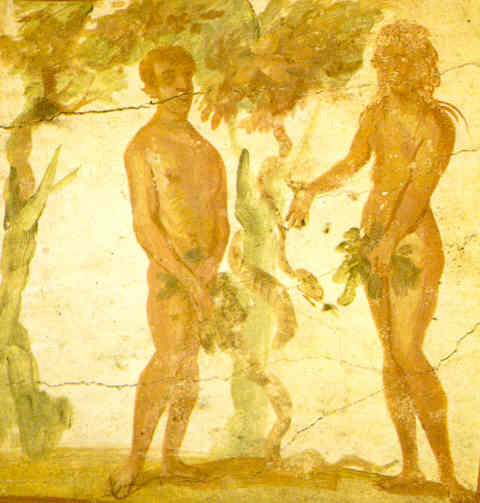 This kind of "fresco" is closer to fresco secco.The wall is arranged almost like a comic book with episodes framed with squared off geometric frames. Within each of the frames are wavelike patterns. In the center of the main altar wall is a niche (a semicircular indentation very similar to the Islamic mihrab) that would have been used to hold the sacred scrolls of the Torah. The over all design of the synagogue (temple) is based on secular architecture. It was once a private atrium style house with a central courtyard. 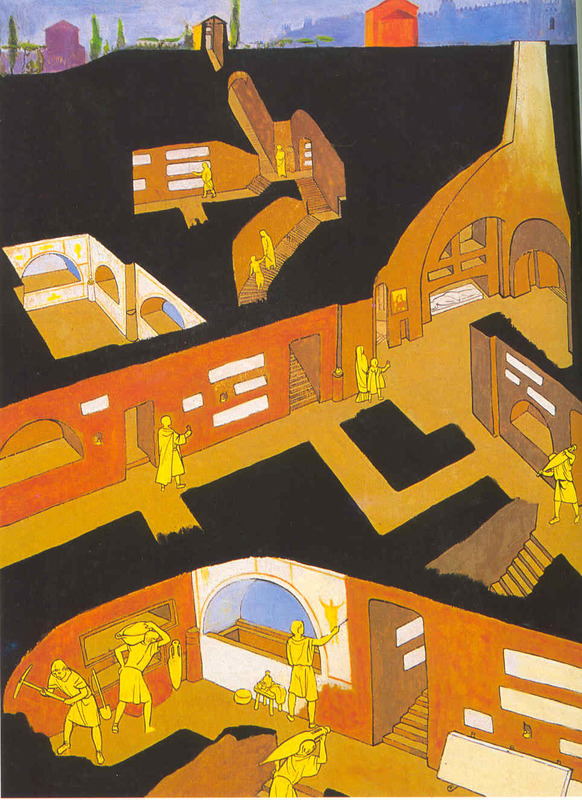 Iconography: The placement of the Torah in a niche at the center of the wall full of narratives focusses the worshippers on the book from where the illustrations were inspired. The Torah is a sacred scroll that is created in a similar way to the manner in which the Islamic Koran is created. Placing it in a special setting is symbolic of its status in Jewish worship. Context: The name Dura Europos is a composite of two names. The Romans called it Dura and the Greeks Europos. 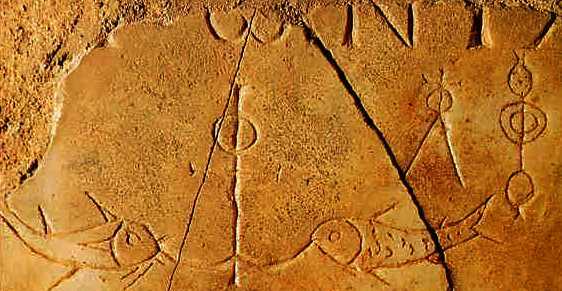 Gardner refers to Dura Europos as the "Pompeii of the desert" because it is so well preserved. The history of the site has a lot to do with its preservation. It was originally a distant Roman outpost that was invaded by the Parthians (Persians under Shapur I) around 256 or after. When the Romans liberated the town they evacuated all the residents and so the site was left relatively undisturbed for centuries until a French soldier in the 1920's noticed some mosaic in the ground and then the site was excavated. There is also a Christian community house at Dura Europos and what is a bit strange is the apparent peaceful coexistence of Romans, Christians and Jews in the same outpost town. Janson describes the influence of the interaction of the cultures as a melting pot which influenced the styles of the art found there. reconstructed at the National Museum, Damascus,Syria. population expelled. Jews began to settle throughout the Roman Empire, along the coast of North Africa, in Italy and Spain, along the river Rhine and in France. Forms: This niche is in the form of a Roman arch. The columns and all the ornamentation on and around the niche are painted in tempera. Some of the ornamentation, specifically inside the niche and on the columns is meant to simulate marble inlay. This kind of fake finish is sometimes referred to as faux finish.Above the niche is a scene bordered with a thin holding line that represents a candelabra on the left called a menorah, an image of an arched doorway, which is probably a representation of the ark of the covenant and a scene depicting the Abraham and the sacrifice of his son Isaac. Iconography: The niche's shape and placement in the temple emulates the shape and placement of the apse in Roman and Christian basilican style architecture. The use of a Roman arch and Roman columns is probably an adaptation of Roman and Greek iconography to show honor to the sacred scrolls. The temple or ark in the center of the image is centrally located because it is central to the Jewish faith. The destruction of the Temple in Israel in 70 CE marked a tragic loss for many Jews. The idea of all the Jews returning to the land of Israel and reestablishing the temple there is part of religious doctrine. It is believed that this will mark a new age. The story of the sacrifice of Abraham and Isaac is symbolic of faith and echoes the ideas expressed by the candelabra across from it. Abraham was called on by god to sacrifice his son Isaac. He brought Isaac to the altar and just before he did, an angel came and stopped him. A lamb was provided for the sacrifice which is in the lower right hand of the composition. The candelabra, called a menorah, is a symbol of Judaism that specifically represents a resistance to outside forces or enemies. The sacred flame is a symbol of faith in many cultures and it is also a symbol of enlightenment. The menorah is a lamp that was used in the original temple of Israel before its destruction in 70 CE. The tree like appearance could be a representation of the branches of the 12 tribes of Israel. The shape of the menorah at Dura Europos was already well established and has its roots somewhat in the holiday of Chanukah or Hanukah. Menorah also spelled MENORA, multibranched candelabrum used by Jews in rites during the eight-day festival of Hanukka. It has taken many forms throughout the ages, but its essential feature has always been eight receptacles for oil or candles (one lit the first day, two the second, etc.) and a further receptacle for the shammash ("servant") light, which is set apart and used for kindling the other lights.This menorah is an imitation of the seven-branched golden candelabrum of the Tabernacle, which signified, among other things, the seven days of creation. The cup atop the central shaft, which is somewhat elevated to signify the Sabbath, was flanked by three lights on each side. The seven-branched menorah is mentioned in the Talmud and has long been used in art as an iconographic symbol signifying Judaism. Form: Overall there is no cohesive narrative or illusion of space or light to unify this composition. The scene is a fairly flat image that attempts to communicate the idea of space through vertical perspective with a bit of overlapping. The size scale relationships of the figures do not correspond accurately from one figure to the next. 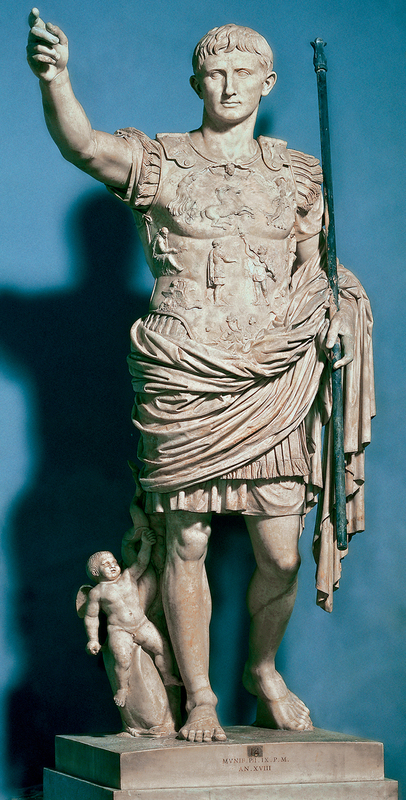 The anatomy and postures of the figures refer to Roman and Greek contrapposto but just don't seem to get it right. Some of the figures cast shadows, but, the use of light is not consistent throughout the image.The temple is depicted as a typical ashlar wall with Roman style arches cut into the wall. The ark inside depicted as Greek style temple. The clothing style of the incidental figures (not of Aaron) is Persian and the name Aaron is inscribed above the largest figure in Greek. Iconography: Janson's Art History, describes the organization of space as iconic rather than illusionistic. It is designed according to importance rather than illusionism. The tabernacle and menorah are placed in the center of the composition which indicates their significance. Aaron is depicted as the largest figure and he sports a beard which may symbolize his age and his wisdom. His clothing is depicted in detail because it is the costume of a priest. The depiction of the ark as a Greek temple somewhat in the style of the Parthenon is incorrect according to biblical descriptions of the ark or tabernacle because according to Janson, "our artist could not imagine it, in accordance with the biblical description as a tent like construction of poles and goat's-hair curtains." Nevertheless, the reason is more complex than that. 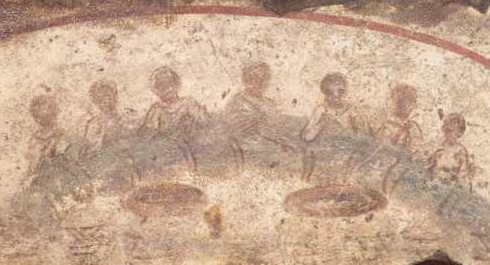 The depiction of the tabernacle is in the vocabulary of the people of Dura Europos who would have identified the Classical vocabulary as honoring the tabernacle. Hebrew PARA ADUMMA, in Jewish history, unblemished, never-before-yoked animal that was slaughtered and burned to restore ritual purity to those who had become unclean through contact with the dead (Numbers 19). Certain spoils of war and captives were also purified in this way. After the blood of the red heifer had been sprinkled by a priest, the carcass was totally immolated with cedarwood, hyssop, and a scarlet thread. The ashes were then carried to a clean spot and mixed with fresh water in an earthen vessel. 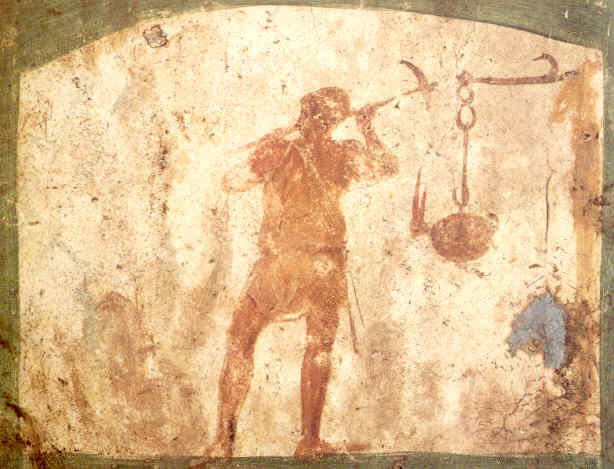 A sprinkling of the mixture restored purity to all who had taken part in the ritual.The significance of the ceremony has been related analogously to the scapegoat, to the heifer sacrificed near the scene of a murder (Deuteronomy 21:3), and to the idolatrous worship of the golden calf (Exodus 32). In synagogues the command to sacrifice a red heifer to restore ritual purity is read on Shabbat Para, a special sabbath that precedes by a few weeks the festival of Passover (Pesah). Syria. Form: Both of these images are fairly flat and diagrammatic. The space and costuming are similar to the image of The Consecration of the Temple and its Priests. The compositions are both fairly symmetrical with the most important action taking place in the center.The style of drapery and pose of the Pharaoh's daughter who reclines on the couch references the drapery style of Byzantine manuscripts and poses from classical sculpture. Particularly those from the three figures from the pediment of the Parthenon. The story of Moses can be found in Stokstad. The scene from Elijah here is taken from the Encyclopedia Britannica. When the Baalists had failed, Elijah rebuilt an old altar of Yahweh, poured water on the wood three times (perhaps a remnant of an ancient rainmaking ceremony? ), and prayed to Yahweh to answer his servant; "the fire of the Lord fell, and consumed the burnt offering, and the wood, and the stones and the dust, and licked up the water that was in the trench." Though some authorities explain the action by suggesting that Elijah poured naphtha on the wood, this does not explain the ignition of the wood at that particular time and that particular place even if by a bolt of lightning. The Deuteronomic historian emphasized the miracle wrought by Yahweh. The people, upon witnessing the miracle, cried out, "Yahweh, he is God," and proceeded to annihilate the prophets of Baal. Both of these images rely on their own iconic system traditions but supplement this by sharing or borrowing from the cultures they have interactions with. The menorah is an obvious example of a Jewish icon, the orantposes in the scene from Elijah are shared, but the clothing styles and poses are borrowed. Possibly this occurred because Jews originally were barred from developing their own visual traditions by the Second Commandment and complex narratives were hard to develop independently.